A toy size Shar-Pei will be about 13" and weigh about 25 lbs. 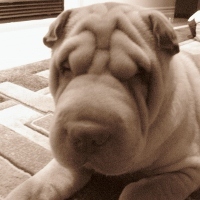 (A shar-pei is a very muscular, stocky little dog and will weigh more than you think.) Very few exist. You must be careful not to get one that is small because it is sick. Every once in a great while I will have a toy size. I will not sell one represented as a toy until they are between 4 and 5 months old.